Monday, June 12th, 2006 | 2:16 pm	and filed in Reason, ReBirth, Combinator. Rather than let this one continue to sit on my hard drive, I’ve decided to release the RB-303 refill. This fill is comprised of samples created using the ReBirth 303 Bassline synth, processed through a vacuum tube preamp and vacuum tube compressor. [Read More Here] I’ve received the OK from the props, so everything is set to go. The set is still in a semi-finished format. The samples have not been looped, and the combi skins are variations of the generic peff.com image. Every note is sampled, so note durations are not affected by pitch transposition. For typical 303 synth lines, the durations are long enough and should not be a factor. The Slide feature in the same manner as ReBirth or a 303, so as a workaround, there is an extra set of samples with moderate portamento settings. I was torn between using the NN-19 which would have made this easier to implement, but something about the NN-XT 6dB filter added to the sound of the patch. So features were sacrificed for sonic character. Also included in the ReFill is a ReBirth Type PCF combinator patch which provides another integral feature of the ReBirth Sound. Because I ran out of combinator knobs, the patterns must be selected manually by changing the Matrix Pattern Sequencer directly in the Combinator Device Rack. A Linear Pan Delay effect is also included in the ReFill. This is simply a tempo synchronous panning delay that is based on faders rather than panpots. The result is delay signals are louder when panned to either side and decrease in level as they pan towards the center. Something i wished I had in ReBirth but couldn’t achieve without the help of a ReWire host and a plug-in. 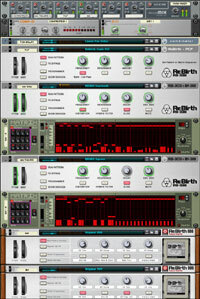 Several Demo RNS files are included which require the Propellerhead Software ReBirth RB-338 ReFill. Available through the downloads area on the Props Website. The RB-303 combis are based on the Bass Filter patches, released here several months ago which added filtering and specialized equalization that attempts to emulate the roland 18dB filters. Its a chains of effects that relies on the 6dB filter of the NN-XT in conjunction with an ECF-42 and a MClass Equalizer. It’s by far from a perfect copy, but it’s functional and provides a 303-ish experience. There are four different combinator patches provided in the ReFill. RB-303.cmb loads both the sawtooth and squarewave samples, and allows the user to switch between the two by toggling combi button 4. RB-303 Sawtooth.cmb and RB-303 Square.cmb simply load one set of the samples. RB-303 Sawtooth & Square.cmb loads both sets and plays both sets of samples simultaneously for a thick layered sound. FREQUENCY Knob controls the filter cutoff frequency and modulates the MClass EQ settings. RESONANCE Knob controls the filter resonance on the NN-XT and the ECF-42. This control also modulates the EQ shape. DECAY Rotary modulates the decay and release stages of the envelopes on the samplers as well as the secondary filter. ENV.MOD Control increases the modulation intensity of the ECF-42 only. DISTORTION Button, enables a preset distortion patch embedded in the combinator. HYBRID FILTER Switch toggles between the 18dB Low Pass configuration and a hybrid of the NN-XT 6dB lowpass and the ECF-42 12db Band Pass filter. SLIDE Enables the portamento feature on the NN-XT samplers nested in the combinator patch. MUTE Button, mutes the output signal. SQUARE-SAW Button, featured only on the RB-303 combinator, switches between the two sample sets. This combinator patch requires users to show devices and select a Matrix Pattern that triggers the ECF-42 envelope. Many of the Original ReBirth PCF Patterns are transcribed based on the pattern illustrations in the ReBirth manual. Other patterns, especially in Bank D, are original. FREQUENCY Knob controls the filter cutoff frequency. RESONANCE Knob controls the filter resonance. AMOUNT Control adjusts the modulation intensity of the Env.AMT and Vel. parameters on the ECF-42. BAND - LOW PASS Switch toggles between the ECF-42 BP 12 and LP 12 modes. Great man, Ive been waiting for this… I didnt know about the 6 db filter in NNXT too, learn something new every day…. Met you at ReMix S.F..
Peff you are definitely the Master Yoda unequaled Propellerhead Reason/ReBirth evangelist philanthropist ! ! ! Gots to love ya ! ! ! With Much Gratitude Dude ! ! ! Thanks for this I can’t wait to check it out…and thanks for all your help your books have helped me soooo much. I can’t forget to mention your excellent article in Computer magazine fantastic!!! Wow, this refill is fantastic. 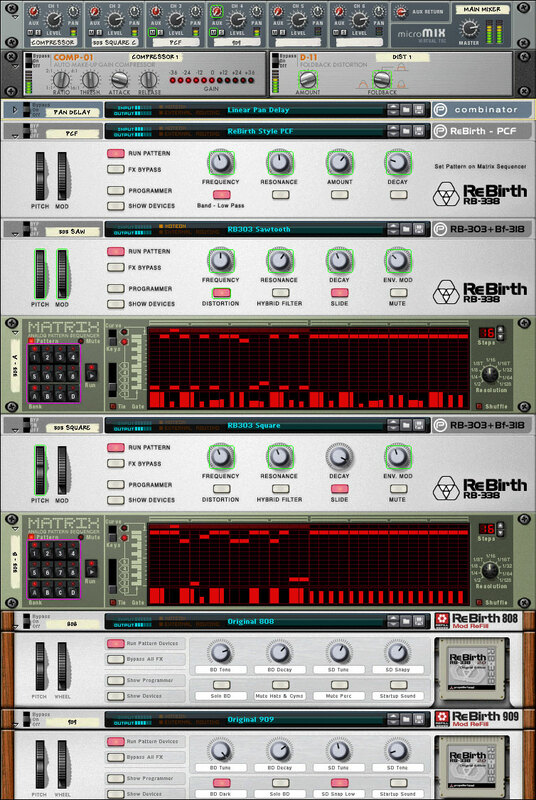 The only thing I didn’t really like about Rebirth was the way in which patterns had to be sequenced… I love the Reason sequencer and Matrix devices so this is a Godsend. Cheers! ‘Can’t thank you enough, man. Can’t wait to d/l this one and give it a go. Sorry for the Language mistake! I’m Hungarian! Thanks everyone. I’m glad you’re enjoying the sample set, however, it will be changed! I’ve recently looped all of the samples and devised some new combis that better emulate the 303 accent feature. Hey Phillip: ZB-S+S is a basically a synth pad that uses the RB-303 samples as a source. This has been modified in the next version. Tidus: Sorry, you should contact propellerhead software support about your license. They are very good about taking care of their registered users. From mexico city….this is a really nice place!!! !, and the RB-303 refill is the best. somebody knows something about the site: combinatorhq.com???? ?